SINGLE LED STROBE | Kuntzleman Electronics, Inc. 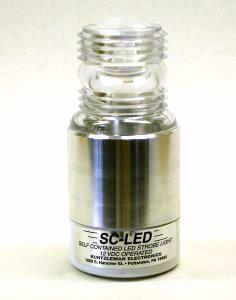 The SC-LED STROBE is a self-contained WHITE LED 12/14 VDC operated strobe light. Designed specifically for use where an external 12 vdc power source (battery) is available. Its size is the smallest of any self-contained LED strobe light in its class. Measuring 2 ½” diameter at the base by 4.75″ tall, weighing only 7.8 ounces. It is fitted with a Fresnel lens. The flash is in a 5 MULTIPLE BURST PATTERN of 72 cycles per minute. Power consumption is 500 ma (1/2 Amp) with an average draw of 0.3 Amps. The SC-LED strobe is mounted with a 1/4 X 20 stud located in the center on the bottom of the unit. Its rugged construction makes it a great economical stand-alone unit.